TC-Helicon has unveiled its latest pedal for vocalists, the Critical Mass Gang Vocal and Choir FX. Promising to “inject atmosphere into your live vocal performance”, the Critical Mass packs three four gang and four melodic choir styles, including unison, octave up, octave down, and up and down. Three styles of reverb are also onboard, while Adaptive Tone tech promises to EQ, compress, de-ess and gate automatically to tweak singers' live vocal sounds. The pedal can be powered via a 9V power supply or AA batteries. Intriguing. 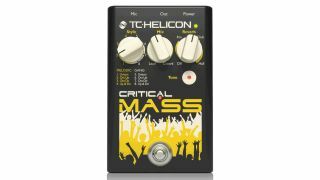 The Critical Mass is available now for $149.99 - see TC-Helicon for more info.